In Avignon, France, in heart of Provence, there’s an incredible 14th century cardinal’s mansion-turned-hotel, La Mirande, where on Tuesday and Wednesday evenings, when the Michelin-starred formal dining room is closed ,hosts a ‘table d’hôte’ in their 19th century kitchen. Here, Chef Jean-Claude Altmayer hosts up to 14 guests around the huge wooden table, where at one end of which he prepares the meal, making use of the old, wood-fired stove. The fixed menu, made using local produce, is chosen according to the daily market and the chef’s own inspiration. I had the pleasure of this unique and incredible dining experience in the spring of 2012. The table was garnished with baskets of fresh vegetables and French bread. As each of the 4 courses was served, the chef talked about the ingredients and the techniques used for the dish. It’s a wonderful experience for anyone who loves to cook or just eat. One of the courses that evening was a roasted monkfish with a spinach basil coulis. It was fresh, delicious and quite simple… and the inspiration for my dish. I substitute cod for the monkfish and I believe halibut would work just as well. I use arugula instead of spinach and add a hint of garlic to add an extra bite to the sauce, which makes for a more tasty complement to the cod. The grapefruit juice provides the right amount of acid to balance the sweet basil and the fish. 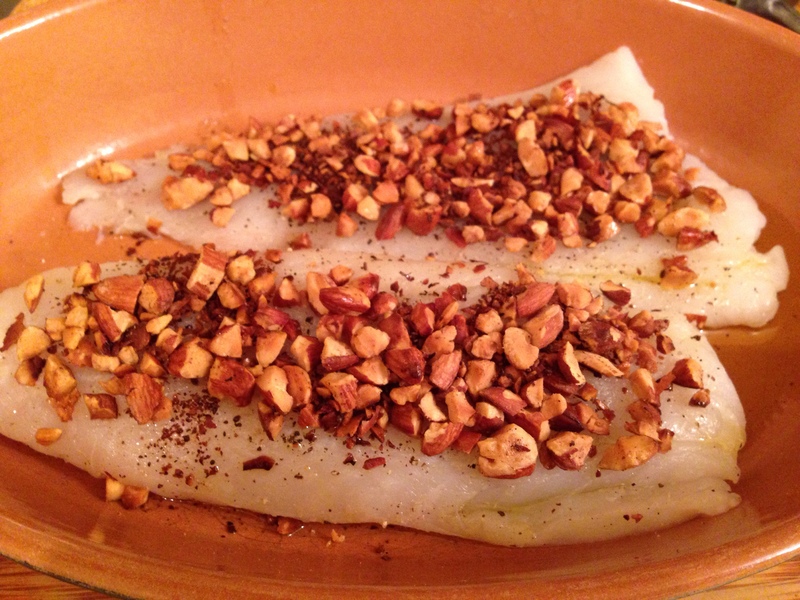 To add more depth to the fish, I coat the fish with toasted crushed almonds. This is an easy dish to make and provides a pop full of flavor and texture with each bite. To crush the almonds, I use a meat pounder and a plastic bag. Then toast them for a couple minutes, making sure the almond pieces do not burn. Then mound them onto the fish that has been salted, peppered and drizzled with olive oil. The key here is to push down on the almonds so they press into the fish. Roast the fish for about 12 minutes and serve with coulis dressed on the plate and maybe some extra on the side. Toast almonds few minutes but make sure they do not burn. 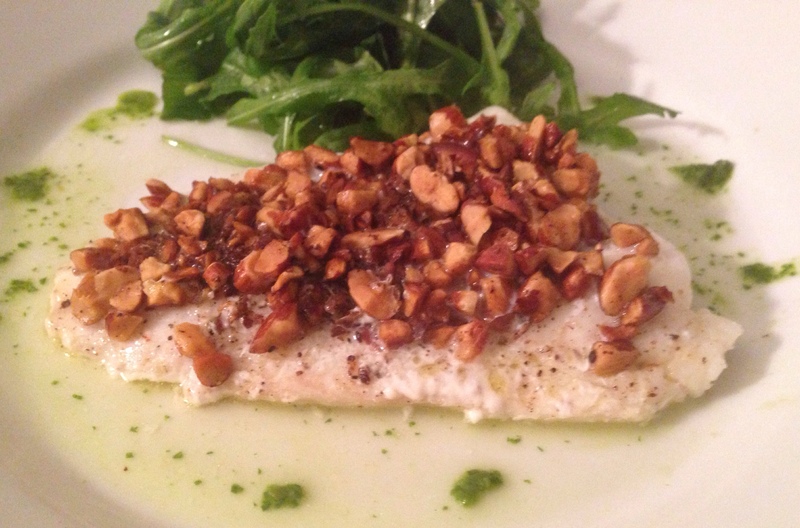 Salt and pepper the fish, top with olive oil, then put toasted crushed almond onto fish, pushing down into the fish. Pre heat oven 400° and bake for 13 minutes. Serve with a few drops or more of Arugula Basil Coulis. This entry was posted in Blog, Recipes on February 1, 2014 by Leslie.